Most storms bring rain or snow, but how about sand? A sandstorm happens when great gusts of wind pick up sand and carry it for miles and miles. The clouds carrying the sand can be miles long. When the sandstorm hits, you’re engulfed in sand and debris. You can’t see anything and your eyes, mouth and nose are coated with sand. 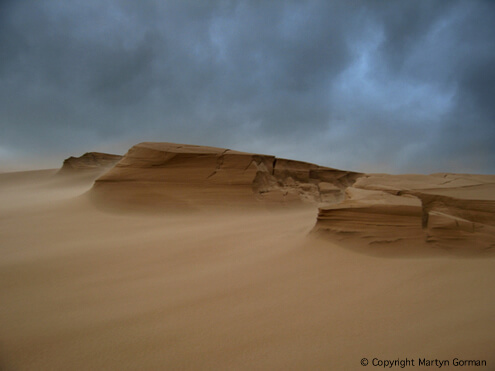 All About Sandstorms: A sandstorm happens when great gusts of wind pick up sand and carry it for miles and miles. The clouds carrying the sand can be miles long. Sandstorms are most common in dry, hot regions like the Sahara desert. They can happen in the United States, though, especially in dry, flat regions like Kansas and Oklahoma. Lots of people farm in these places so there is more bare earth to blow around. Sandstorms can destroy property and hurt people. Sandstorms lift the topsoil off the land. This topsoil is needed to grow crops. 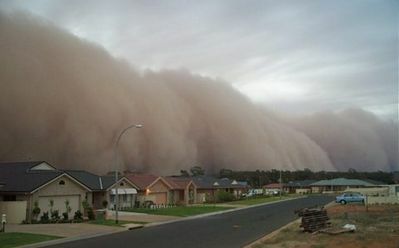 Sandstorms happen most often in the summer. Sandstorms are most common in dry, hot regions like the Sahara desert. 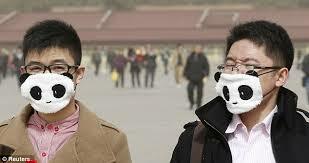 During Sandstorm Cover your eyes and nose with a mask or filter. Question: What should I do in a sandstorm? Answer: Sandstorms are slow moving so you might be able to outrun it in a car. Otherwise, go in a house and close all the windows and doors. Make sure you have water. Cover your eyes and nose with a mask or filter. If you’re outside, hide behind a rock. Enjoyed the Easy Science for Kids Website all about Sandstorms info? Take the FREE & fun all about Sandstorms quiz and download FREE Sandstorms worksheet for kids. For more lengthy info click here. Declan, Tobin. " Fun Sandstorm Facts for Kids ." Easy Science for Kids, Apr 2019. Web. 26 Apr 2019. < https://easyscienceforkids.com/all-about-sandstorms/ >.